When you drive along Third and Main streets in Prineville this Saturday, you will likely notice many American flags flying gently in the breeze. Members of Prineville Band of Brothers are putting out the Flags of Prineville along walkways, weather permitting, to honor Welcome Home Vietnam Veterans Day. "For anybody who has a Vietnam vet in their family, it's nice to honor them and give them the honor they deserve because a lot of them did not get it during that era," said Donna Stuart, a Band of Brothers honorary member, board member and co-director of activities. According to National Conference of State Legislatures, most states celebrate Welcome Home Vietnam Veterans Day annually on March 29 or 30. On March 29, 1973, the last combat troops were withdrawn from Vietnam, and the last prisoners of war held in North Vietnam arrived on American soil. It is also the date President Richard Nixon chose for the first Vietnam Veterans Day in 1974. NCSL says Vietnam Veterans Day commemorates the sacrifices of Vietnam veterans and their families and is part of a national effort to recognize the men and women who were denied a proper welcome upon returning home. The Vietnam War Veterans Recognition Act, signed into law on March 28, 2017, designates March 29 of each year as National Vietnam War Veterans Day. In Oregon, however, March 30 is designated as Welcome Home Vietnam Veterans Day to honor veterans of the Vietnam War. Members of the local Band of Brothers choose to display flags each year on March 30. 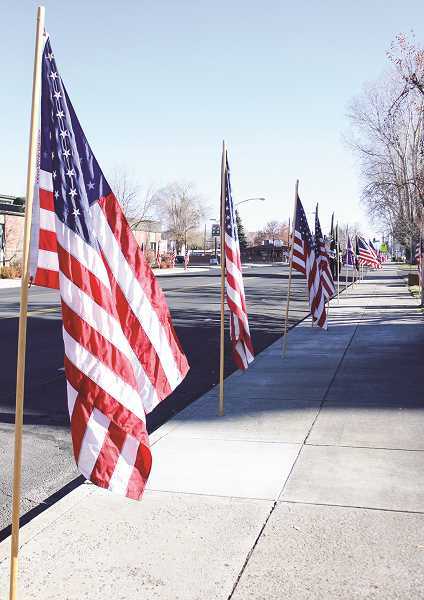 "We just thought that a lot of times the community doesn't know – they know Veterans Day, they know Fourth of July, but this one is one that's a little odd, and people don't hear about it very often," Stuart said of the flags along the streets of Prineville. "We thought it would be good to go ahead and explain what it's for and give some statistics." She pointed out that all 9 million service members enlisted from 1955 to 1975 are included in the Vietnam era. There were 2.7 million service members who served in Vietnam, 304,000 wounded, 1,253 Missing in Action, 2,500 Prisoners of War, and 58,318 memorialized with their names written on the black granite on the Vietnam Veterans Memorial Wall in Washington, D.C.
On Saturday morning just after sunrise, a few Prineville Band of Brothers members will put the flags up along Third and Main streets. They will also fly the POW and MIA flags in front of the Crook County Courthouse. Throughout the day, passersby will have a chance to pause and reflect upon the sacrifices of those who served the nation during the Vietnam era. Just before sundown, the crew will take down the flags. Stuart pointed out that while the Band of Brothers organization does not own the flags, they do take care of the Flags of Prineville. Through Flags of Prineville, people may sponsor a flag and have the name of a veteran embroidered along the edge. Stuart said in Oregon, March 30 is a day to remember all veterans of the Vietnam era, not just those who were physically in Vietnam. "It's for all veterans that were in that era because a lot of them were not welcomed no matter if they were in Vietnam or not. That era was pretty rough for them," she said. "This is a time to honor them."